The great Dutch painter Rembrandt Harmens van Rijn was a great master of the image of human emotions and experiences. The genre’s works of the master are very diverse, but on whatever topic he wrote, the depths of human passions were always paramount for him. One of Rembrandt’s teachers was Peter Lastman – and he had the greatest influence on his student’s style. It was from him that the young author took on a peculiar diversity of image and attention to fine details. In his early work, Rembrandt sought to write down as little as possible all the details and particulars in the paintings. Also one of the features of the artist is addiction to self-portraits. In his youth, he portrayed himself in many sketches of paintings, in the most intricate attires and bizarre poses. In the painting “David’s Farewell to Jonathan,” the creator depicted the biblical scene described in the First Book of Kingdoms. According to the Old Testament, Jonathan was the son of King Saul and a friend of King David. Initially, young David, who was predicted to be unprecedented greatness and throne in his infancy, served under Saul, the first king of the people of Israel. At this time, he became friends with Jonathan (Jonathan), the son of Saul. David’s victories over the Philistines as commander and the killing of Goliath overshadowed the glory of Saul himself, after which the envious king was angry with his faithful warrior. Afraid that David would later take his place, Saul tried to kill him twice; no longer hiding jealousy and enmity, he openly threw a spear at David. The commander had to flee to Rama. The relationship of David and Jonathan is considered the perfect example of biblical friendship. It was the royal son who twice saved David from death, causing the anger of his father. Understanding perfectly well that in the future he will have to, in spite of kinship, yield to David the throne – he happily agreed to be the second after his close friend. In the picture we see the farewell of two close people before the flight of David, at the holy stone Azail. Only the stern face of Jonathan is drawn to the viewer – David is depicted from the back, in despair, crouching on his friend’s chest. It is believed that emotionally writing a painting by Rembrandt prompted the death of his wife Saskia. David, whose face we do not see, looks like a girl with almost white hair; Jonathan Rembrandt gave his own traits. It is known that initially the picture was exhibited in a black, mourning frame, which confirms this version. The overall golden tone, in which the heroes of the canvas are written, contrasts with the gloomy brownish background. The artist sees the friendship of heroes, their devotion to each other, as if illuminated by a golden glow; but here is the reality that separates two men, is dark and merciless. The gentle and light image of a weeping David, dressed in pinkish clothes, attracts the eye; Jonathan, richly dressed in light green, grave and gloomy, is a bit in the shade. The canvas is imbued with exorbitant longing and sorrow. 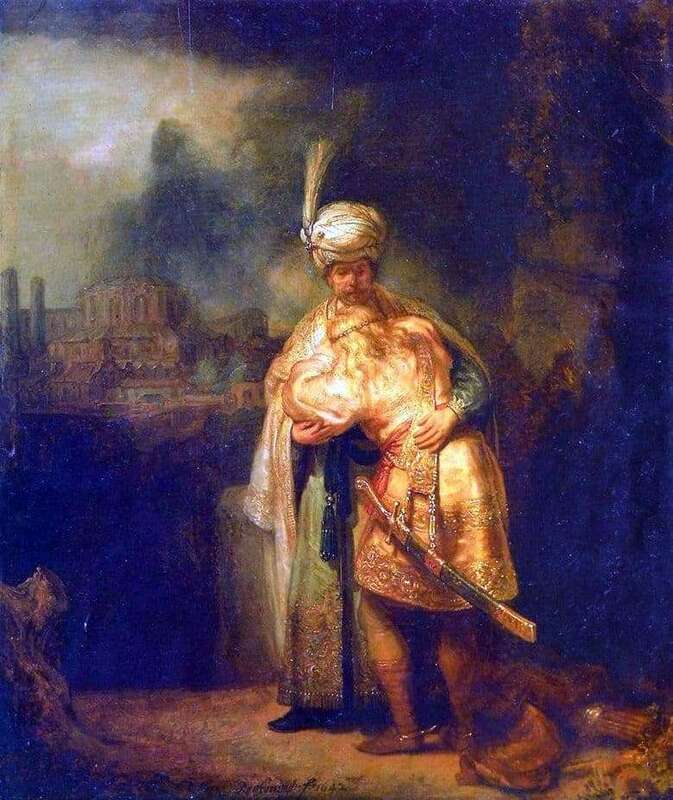 The painting “David’s Farewell to Jonathan” by Rembrandt was purchased by Peter the Great for his collection and is currently in the Hermitage. It became the first canvas to come to Russia from Europe.